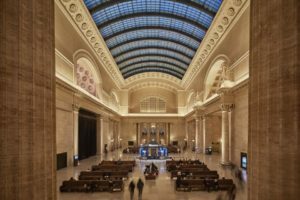 In February of 2019, Goettsch Partners (GP) announced the culmination of a major renovation campaign for historic Chicago Union Station, with the recent completion of the Great Hall Restoration. This $22 million project for Amtrak, which took more than three years to complete, is the latest in a series of major redesign and restoration projects by GP at the station that started in 2010. Originally designed by renowned architecture firm Graham, Anderson, Probst & White, the 1925 Great Hall suffered water leakage and deterioration due to flaws in its original design, and was in need of substantial repairs. 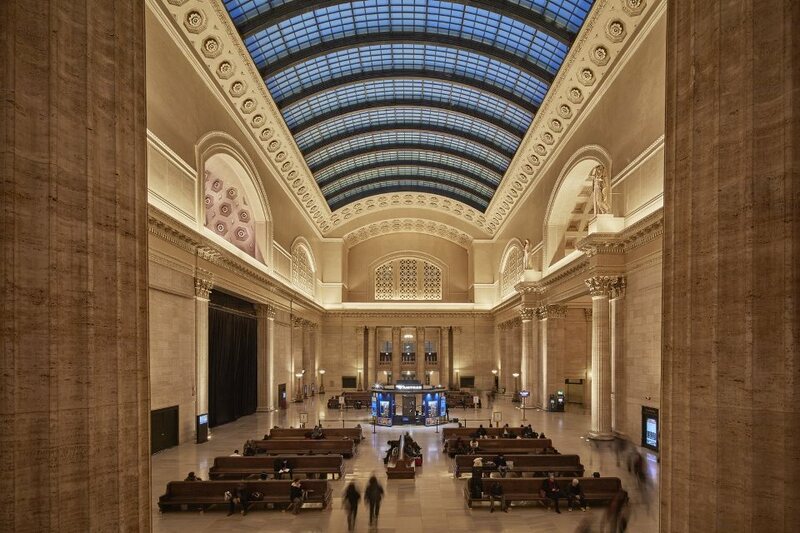 To address the necessary work, the design team renovated the station’s iconic, 219-foot-long skylight, which experienced extensive moisture damage over the past several decades. To restore the cast-iron skylight assembly while maintaining its historic appearance, the GP team, led by Leonard Koroski, FAIA, LEED AP, designed an energy-efficient, modern skylight above the original structure. 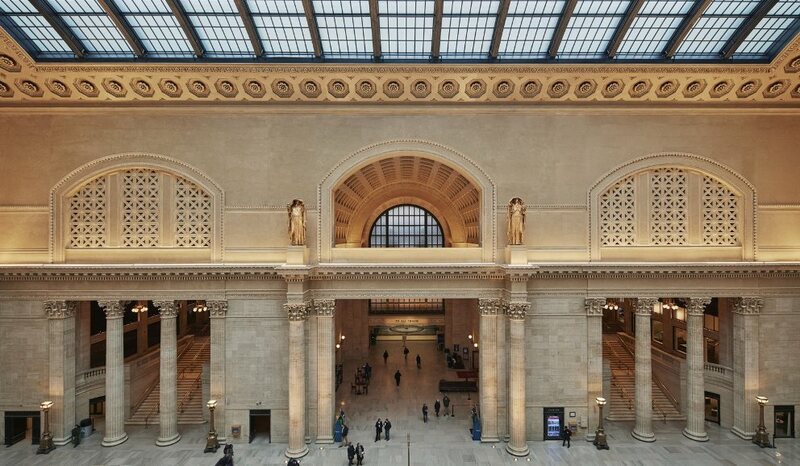 Supported five feet above the restored cast-iron skylight, the new high-performance skylight of steel and 858 panes of clear, high-efficiency glass protects the landmark building while brightening the Great Hall interiors with 50 percent more natural daylight than before. Other work designed by GP included structural improvements, new plumbing, plaster repair, restored ornamentation, and new lighting. “Essential to our vision for this project was preserving the historic design features of the building while making necessary improvements and repairs to stabilize this landmark for the long term,” said GP’s Koroski, who is noted for preservation and adaptive reuse of historic structures, including the iconic Wrigley Building and the Civic Opera Building in Chicago, as well as Mies van der Rohe’s Farnsworth House in Plano, Illinois. Complementing its work at the historic Union Station headhouse building, GP is currently designing a new high-rise office tower to revitalize an adjacent parcel to the south. Developed by Riverside Investment & Development and Convexity Properties, the building’s anchor tenant BMO Financial Group was announced back in December of 2018, with a planned opening in 2022. Photos courtesy of Goettsch Partners. See Chicago Union Station website.